Tis' the Season for all good things! “That’s right”, this time of year tends to bring more warmth, joy, laughter, family activities, friends getting together and the feeling of love. Love of now, love of yesteryear- the love of rituals, love of family, love of shopping, love of good food, love of gifts- giving and receiving. Just a plain ole good time of year that warms up the body and soul. Though all things might not be exactly as we wish, or the struggles seem to be so overwhelming. There is always a spark and glimmer of love within each of us. That spark is enough to make all things possible! This week is the time for me to bring out the annual Christmas/Holiday Sweaters; you know the sweaters that you wouldn’t wear any other time, but this time of year feels so fun and right! Recently I heard that these sweaters are really not acceptable anymore. What? I really missed that news and fashion flash. Rifling through the unpacked winter clothes, found my collection of sweaters! Yeah! Another year of sparkles and shimmering images jumping off my body! Bet the crowd can’t wait to see these again, really missing them I am sure! OK, so which one to wear for the kick off evening? One by one I went through them and not one specific sweater felt right. So I decided to just pick one when the “perfect” sweater appeared! Laughing I picked it up and out loud said “Perfect” I love it…. So appropriate!! 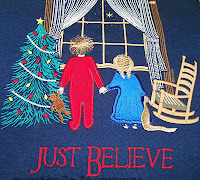 See the sweater was worn by my mom for several years during the holidays! My mom loved Christmas, the tree, and family together and viewing the neighborhood house lights. But more importantly my mom was pure love. Love for herself and love for everyone she would meet during the day all year long! My mom’s message was always loud and clear throughout my life- Just believe- believe in you- believe all things work out- believe in love! 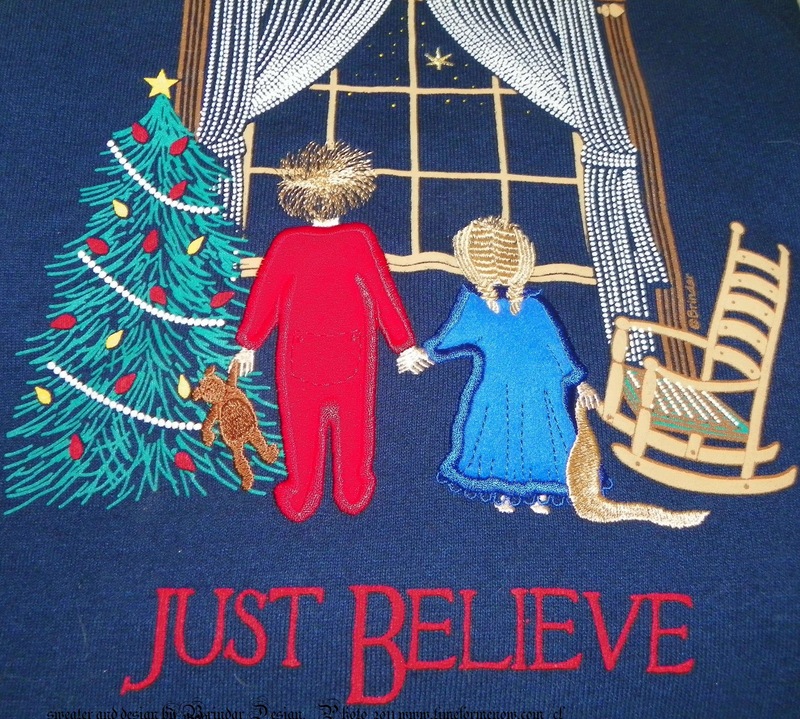 The magic of this time of year is Love- for which all things can happen and are possible if we only “just believe”. So today I am wearing this very warm sweater by Brindar design, the image is above and says it all. Mom, you are always right- I believed and all things are working out with love! May the child inside all of us be allowed to shine, to know that all things are possible if we just believe! Time for now to wish you a very Merry Christmas, Happy Holidays! Remember ~~ Love who you are, as you are enough and Love Life!